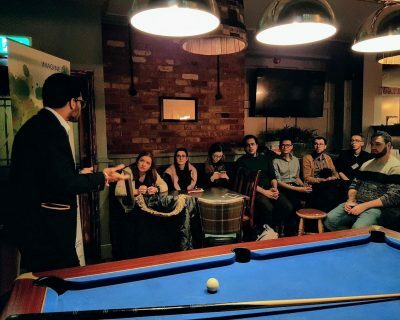 A new year and a new edition of the Innovation Forum’s (IF) “Pitch in a Pub” kicked off 2019 in style on 24th January in Kro Bar, Oxford Road. 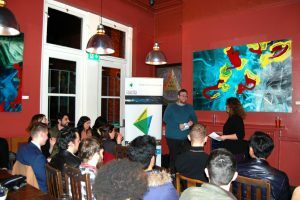 The room was bustling with researchers, students, professionals and young innovators gathered together to listen, learn and discuss the innovative ideas of local entrepreneurs. 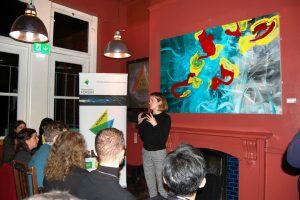 They eagerly anticipated the stories of Dr Eleanor Trimble from Nudge Insights, and Tom Passmore and Sophie Walker from Dsposal. Both start-ups were applying technological innovations to wildly different applications, but equally relevant for 2019. Development, Anastassia Bolotkova. Anastassia introduced IF and its aim as a global grassroots network of scientific entrepreneurs looking to build a community of innovators from both academia and industry to drive forward exciting new innovations. Anastassia was followed by Ruben Ahumada-Lazo, Business Development Manager for IF in Manchester, who managed the rest of the evening’s proceedings. insights into consumers’ responses and behaviours. However, unlike conventional marketing strategies she utilised advanced neuroscience techniques from her PhD at the University of Manchester. Dr Eleanor explained to the audience the expertise of her company, which is focused on the measurement and understanding of human behaviour. By using state-of-the-art technology, such as eye-tracking and EEG, Nudge aims to investigate what makes online consumers tick, how they respond to online content and what improvements can therefore be made to their online journey. Dr Eleanor finally pinpointed the key advantage of Nudge’s technology: by monitoring brain activity and eye-movements, they can uncover the subconscious responses that are unobtainable by more traditional marketing methods. As online marketing becomes a dominant force in the online economy, in-depth scientific analysis as shown by Nudge Insights will become increasingly important for companies to gain a competitive advantage. what is thrown out as valuable resources and try to leave the world a bit better than it is. networking. Once again, this Pitch in a Pub edition was a great success! IF Manchester would like to thank our speakers for sharing their innovative ideas; our attendants for participating and engaging with the discussion and all the sponsors and partners of IF Manchester. If you’d like the opportunity to pitch your idea in our next event or become part of the IF Manchester team, please contact [email protected]. Science: Entrepreneurship in Science and IMAGINE IF! local finals’ on 26th February 2019! Get inspired by this opportunity to hear from great speakers from venture capital and intellectual property companies plus pitches from promising scientific start-ups.